Camps for those displaced by fighting in Sudan's Darfur region are almost full, the UN says. Several camps are having to turn away new groups of refugees, a report for UN Office for the Co-ordination of Humanitarian Affairs (Ocha) says. More than 80,000 people have fled violence in the region since the beginning of the year, the report adds. Two million people are living in camps both within Sudan and in neighbouring Chad since conflict began in 2003. 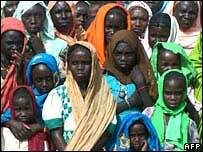 Many fled their homes because of the ongoing violence between pro-government Arab Janjaweed militia groups and rebel groups in Darfur. At least 200,000 have died. The 7,000-strong Africa Union peacekeeping force in the area has not been able to contain the situation. "IDP (internally displaced people) camps are reaching full capacity due to the continuing population displacements," the Sudan Humanitarian Overview report for February says. "In North Darfur, As Salaam camp has been declared at full capacity, due to the lack of water sources to sustain additional incoming IDPs," the report says. "Given that Abu Shouk has already been closed to additional IDPs and that Zam Zam is very close to its maximum capacity, a new location for a camp near El Fasher has to be found." Sudan is resisting plans to allow a beefed-up joint AU-UN force of 20,000 troops to be deployed to Darfur. Sudan insists that the only role for the AU-UN troops should be to monitor civilians living in the internally displaced camps. Sudanese rebel forces took up arms in February 2003, accusing the government of discriminating against Darfur's black Africans in favour of Arabs.